After you have registered and activated your account you will be able to log in to the portal. Go to the portal log in webpage. TIP: Save the log in page as a favourite in your web browser so you can find it easily next time. Type your email address (the one you registered with) and your password. If you have already registered for the Portal and activated your account but forgotten your password reset your password. 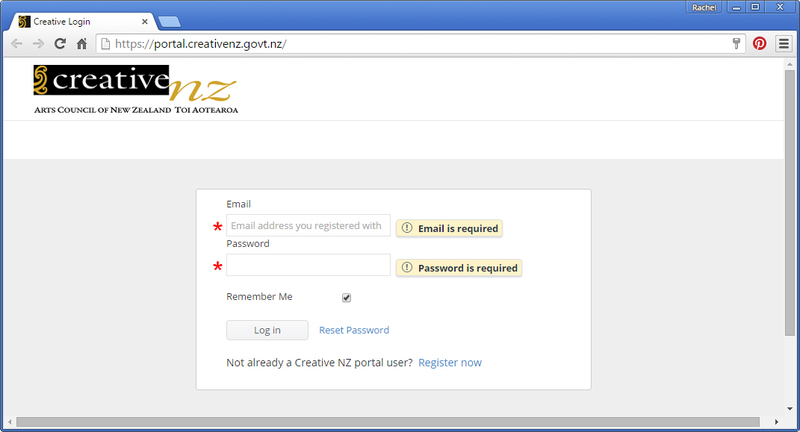 If you have already registered for the Portal and activated your account but forgotten which email address you used contact Creative New Zealand. After five failed log in attempts your account will be locked for security reasons. Ask Creative New Zealand to unlock your account.